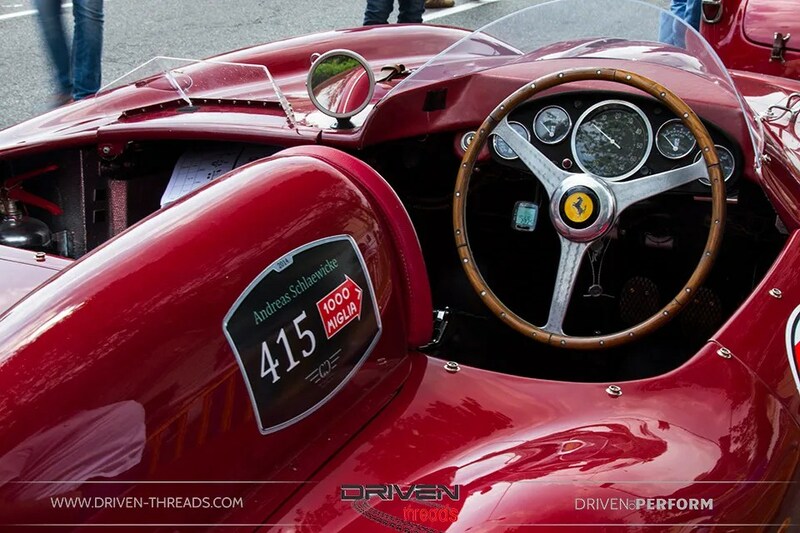 Enzo Ferrari was not lying when he said that the Mille Miglia is the most beautiful road race in the world. A Thousand Miles. 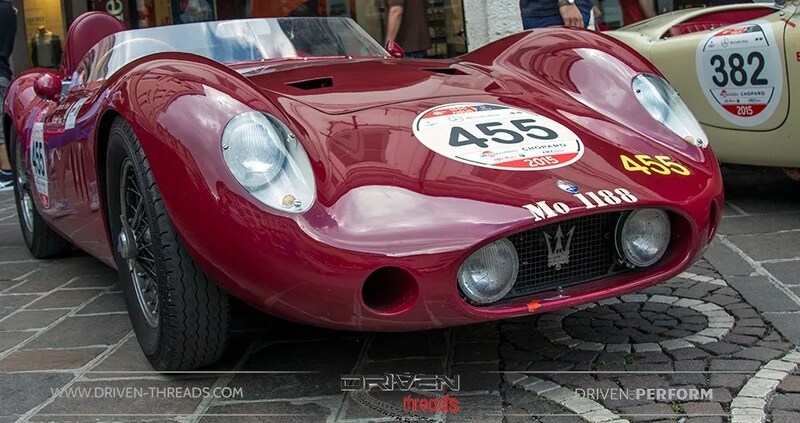 Amazing cars. In a breath-taking country. What else could you possibly want? 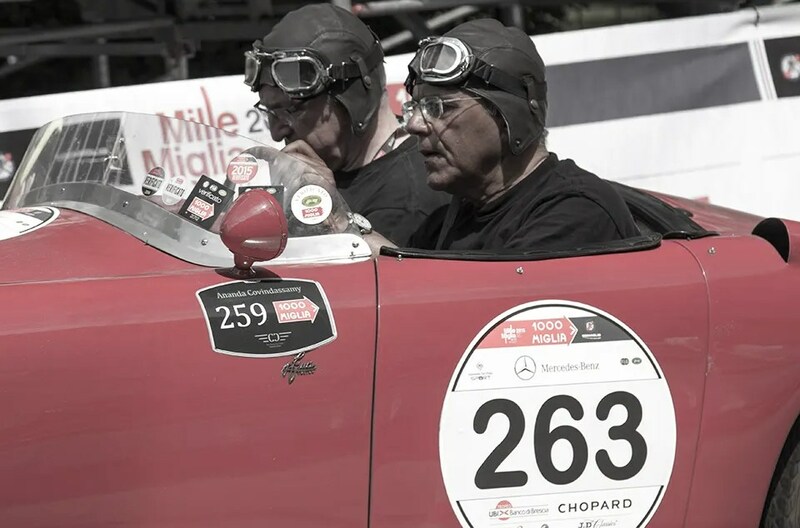 The original Mille Miglia was run in Italy 24 times from 1927 to 1957, with a break during the war years. 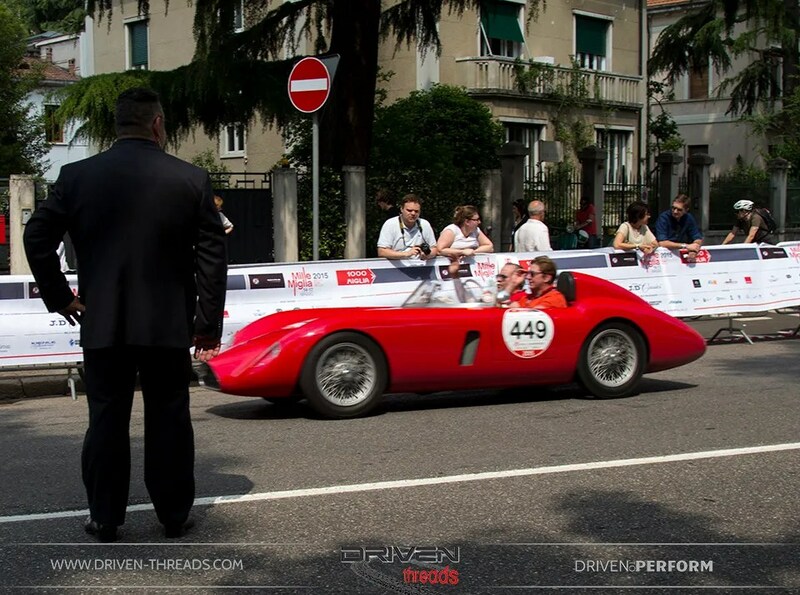 A lack of safety resulting in two fatal crashes ended the original Mille in 1957. 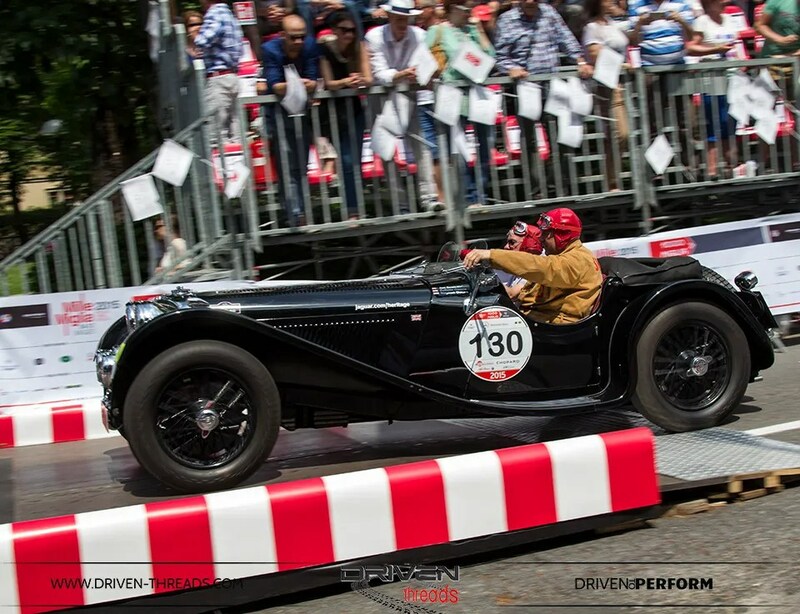 This year was the 31st re-enactment of the modern ‘time trial’ Mille Miglia. 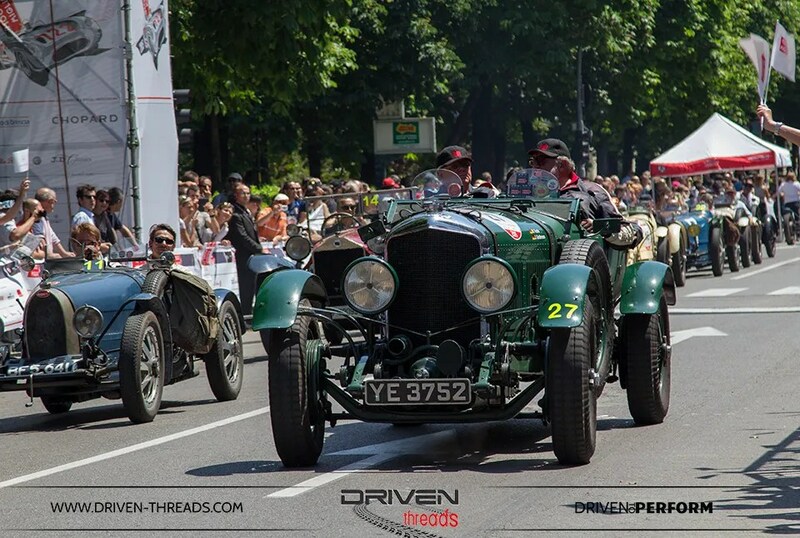 The race as it is to day was first run in 1977 as a time trial exclusively for classic and vintage cars. 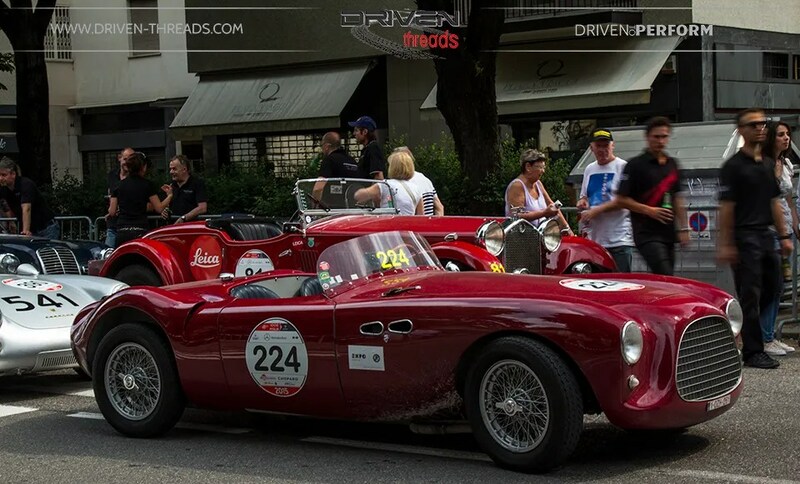 To participate your entry needs to be produced no later than 1957 and be of a car type that would have completed in the original event. 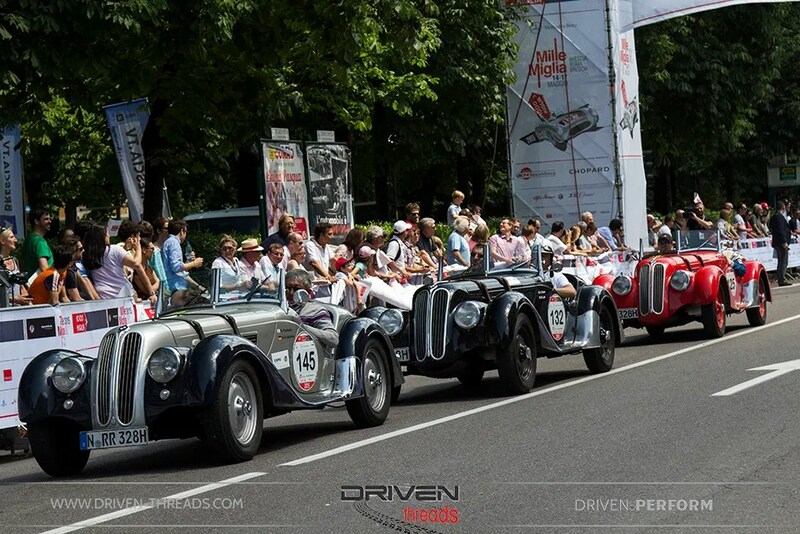 This year’s route was similar to the that of the orignal race, a round trip from Brescia to Rome. Priceless, rare and exclusive. 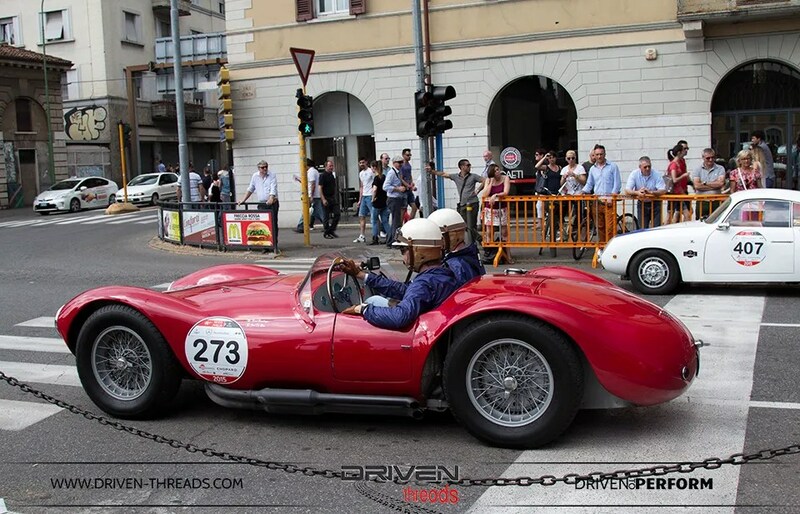 The Mille Miglia attracts the best Alfa Romeo’s, Ferrari’s, Bugatti’s, BMW’s, Porche’s, and Maserati’s in the world. 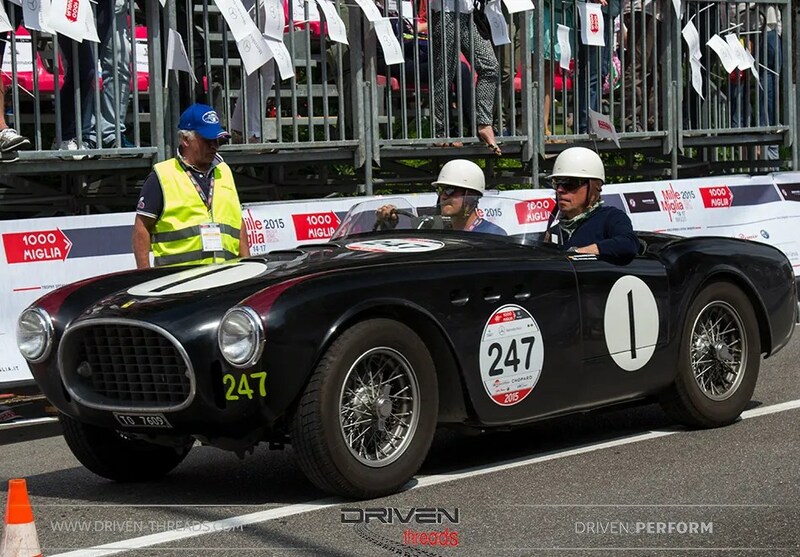 All Mille Miglia cars tell a unique story, many have a competition history and many have actually competed in the original Mille. 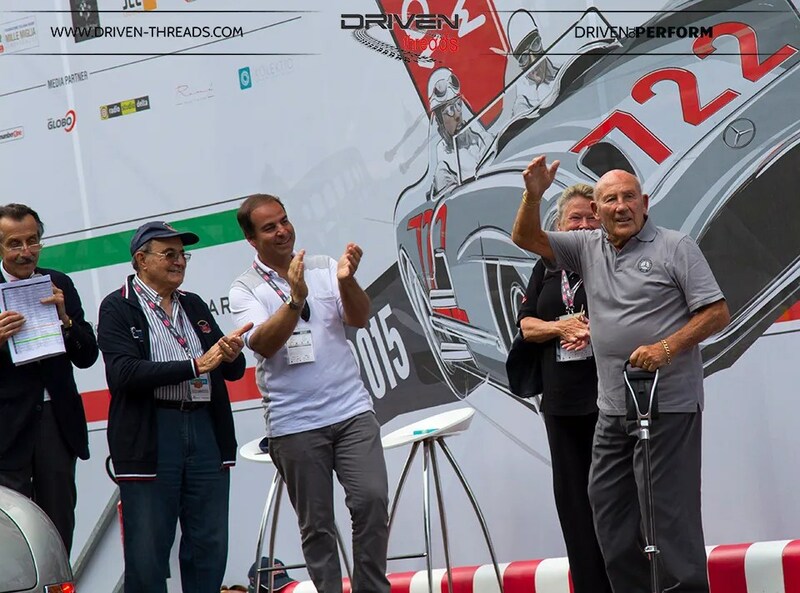 Many have Grand Prix histories, many have had famous owners. 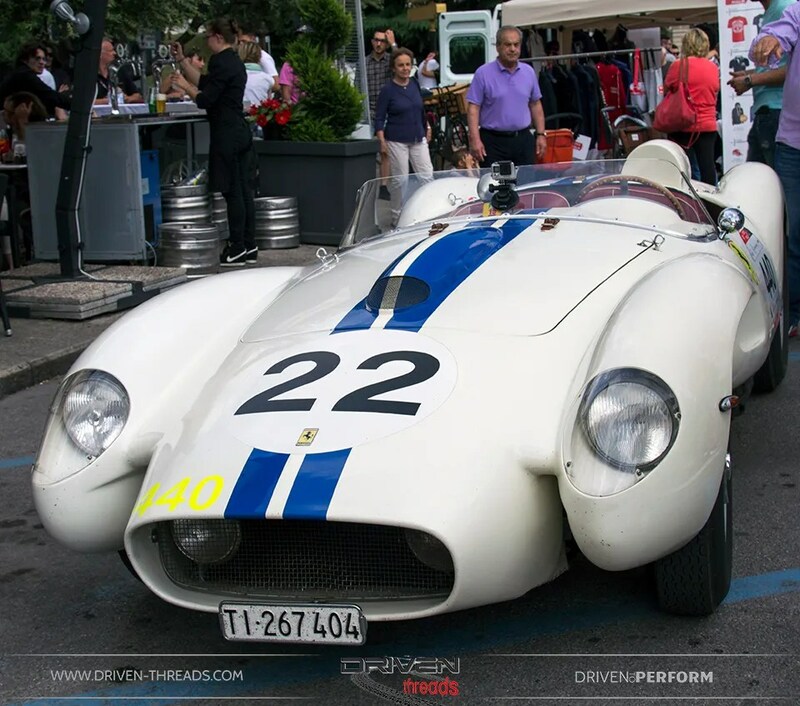 Many are conservatively worth a couple of million. 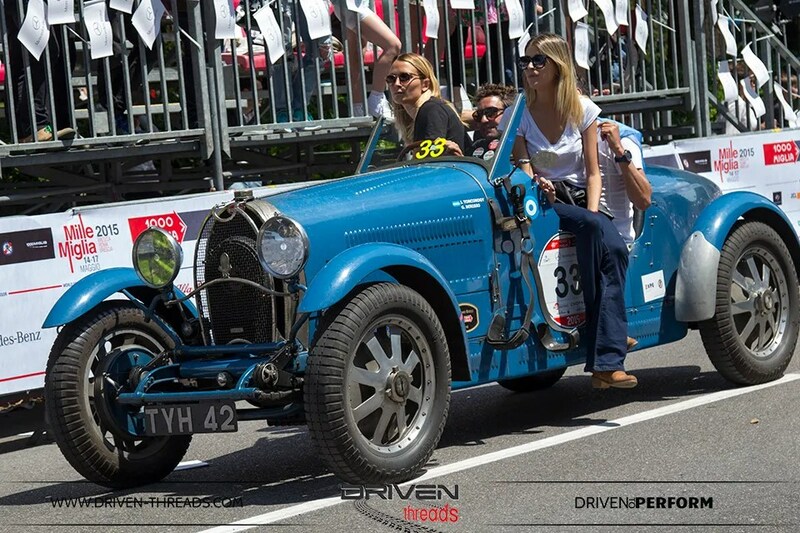 This 6 cylinder Riley MPH, is the prototype of only 15 cars produced. 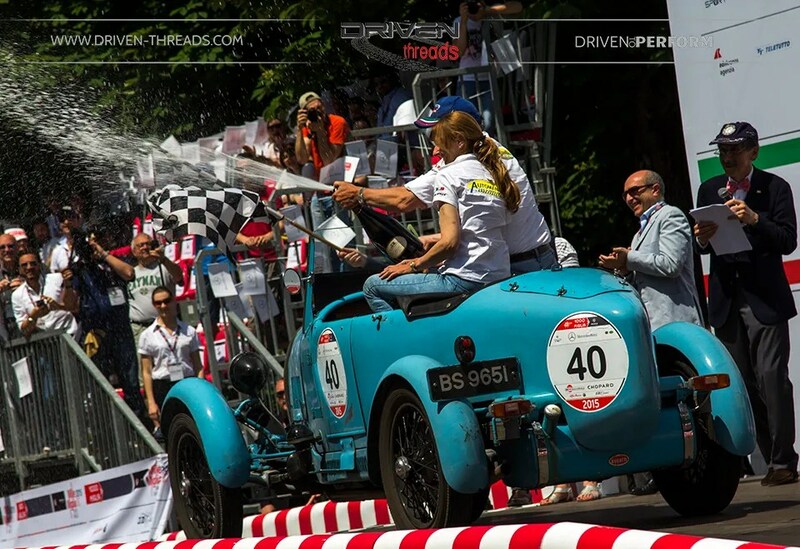 We caught the cars as they came through the finish line in Brescia and basked in the amazing glory of the cars and in the celebrations of the event’s conclusion. 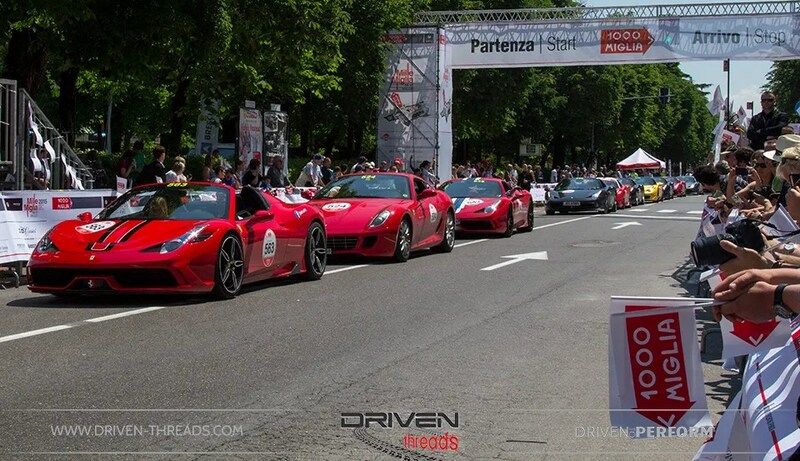 You get the impression that the whole of Italy is behind this brilliant event. It felt like everyone was joining in on the celebrations. 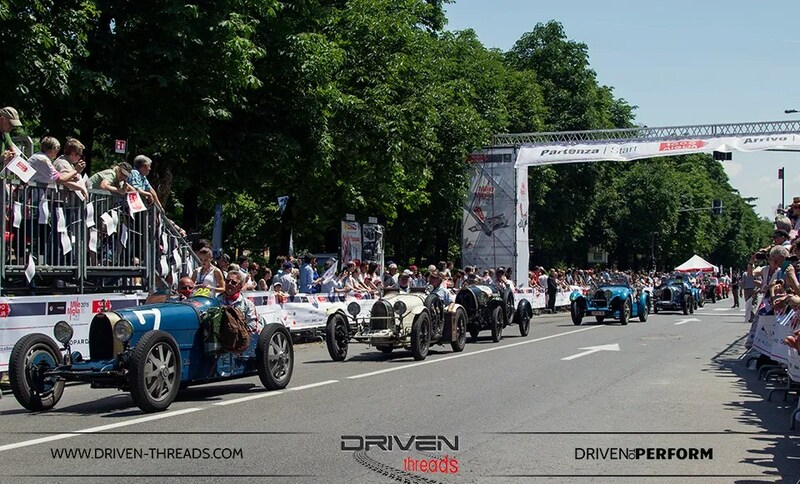 Huge crowds saw the cars across the finish line and the event was very well supported throughout its four days of competition. 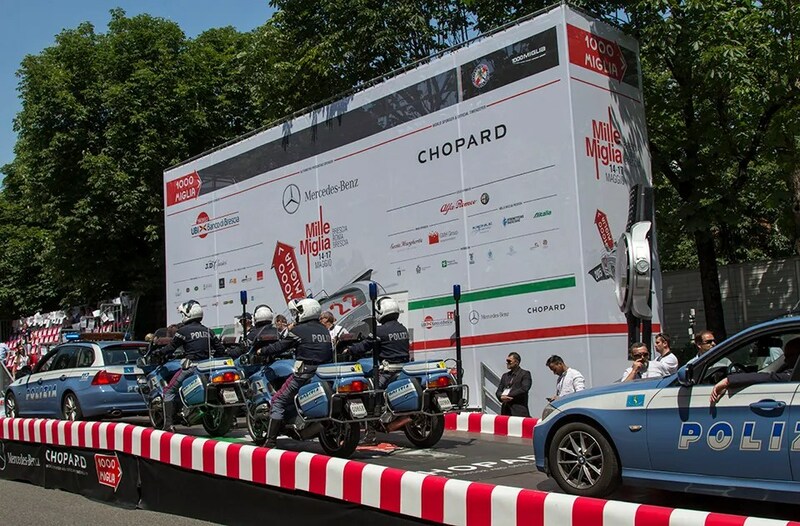 The Police were hugely appreciated and respected for their work in clearing traffic to allow the event to run on public roads. Fittingly they took part in the finale. 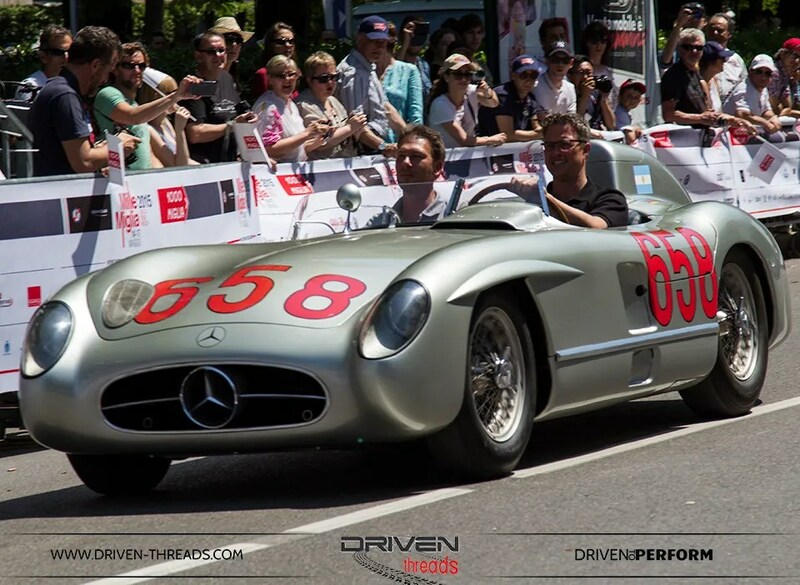 Such is the calibre of this event, its not difficult to spot a celebrity. 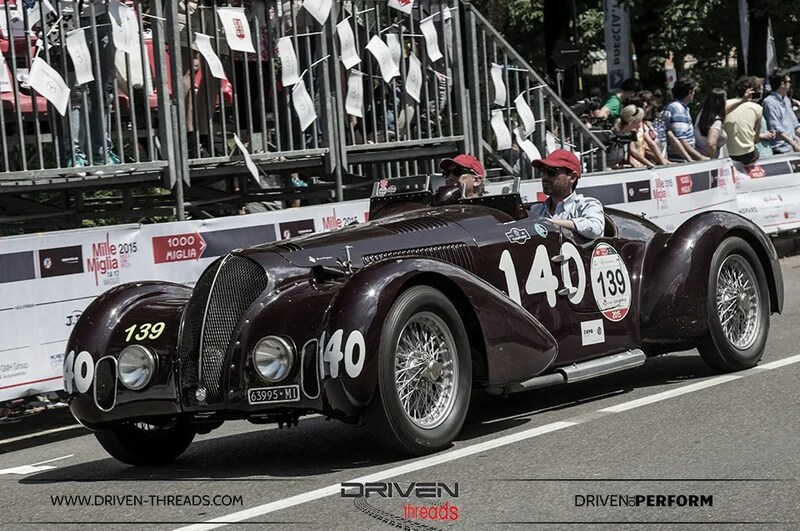 You don’t get a bigger motoring legend, than Sir Stirling. 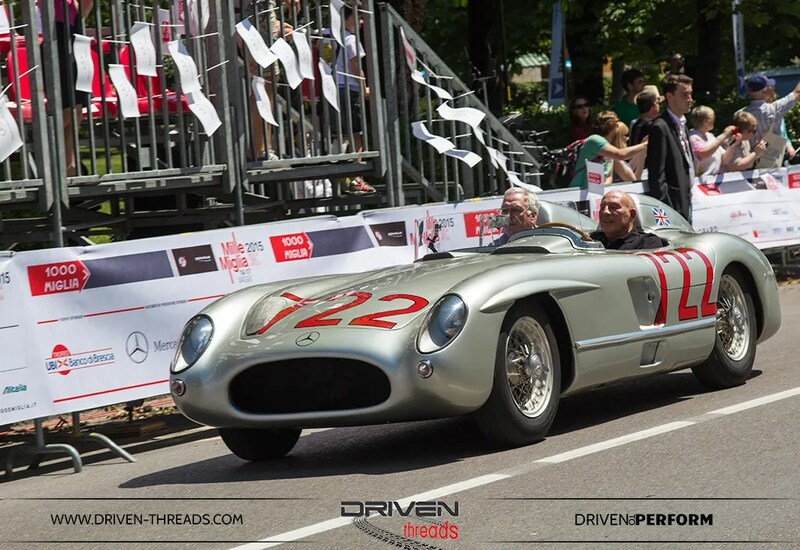 It was spine tingling to witness Sir Stirling Moss pilot his famous 722, the car that he won the Mille Miglia in 60 years ago. 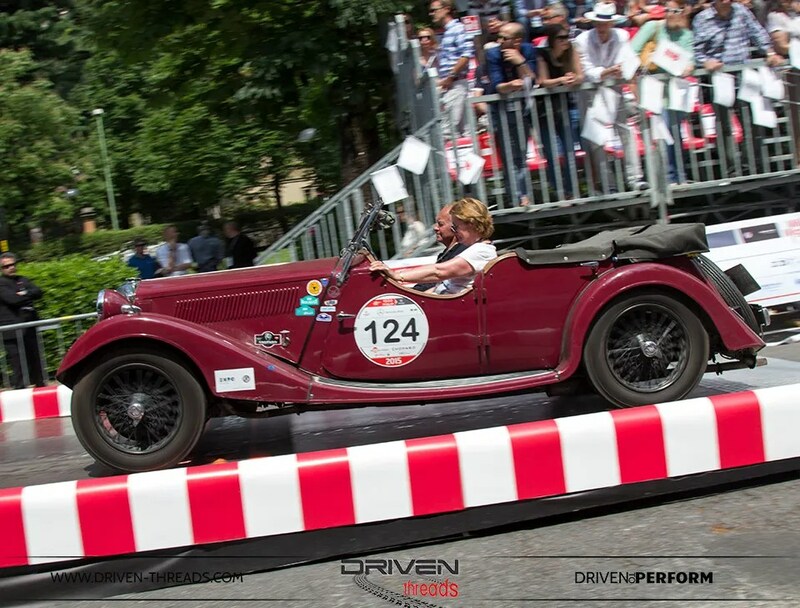 To the delight of the crowds, he later waved the chequered flag for thrilled participants. 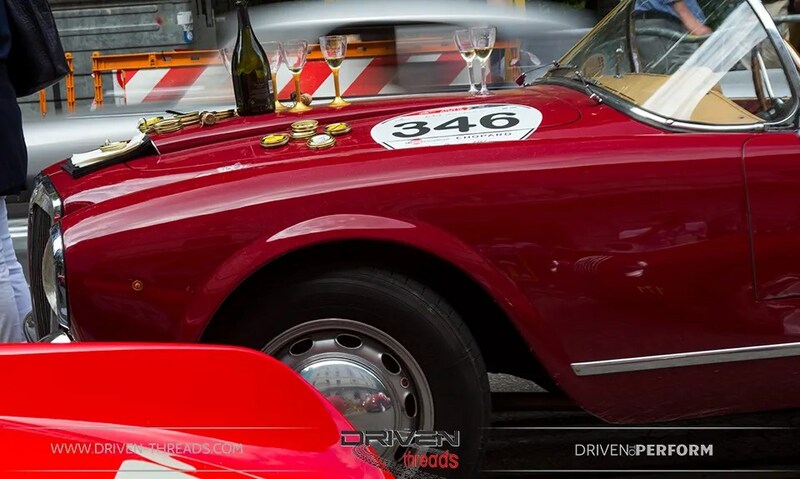 Memories of his famous victory on these streets so long ago, certainly not far from his mind. 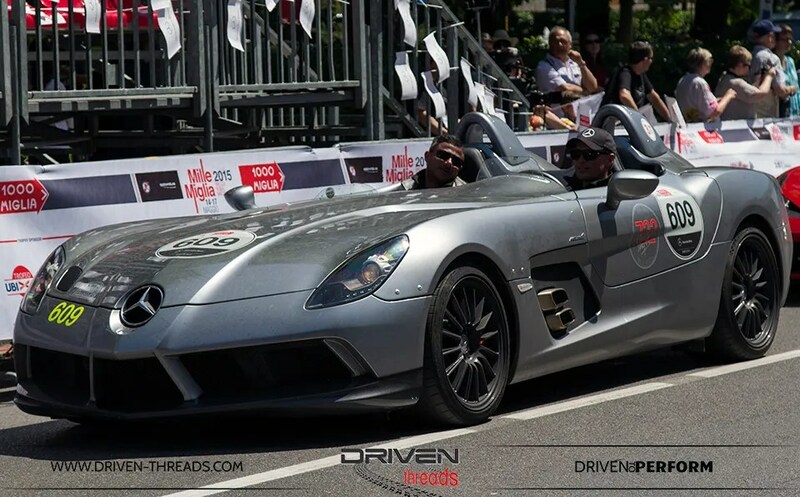 Ralph Schumacher behind the wheel of yet another priceless Benz. 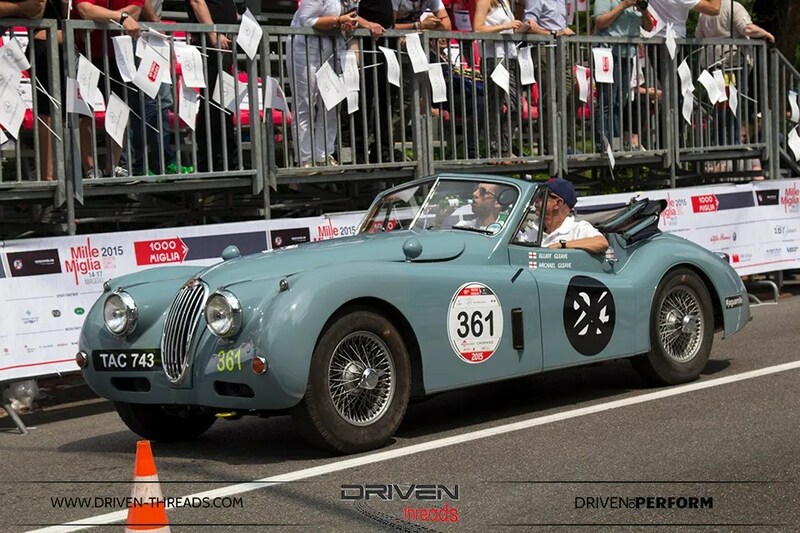 Jodie Kidd and David Gandy bring home their elegant Jaguar XK120. 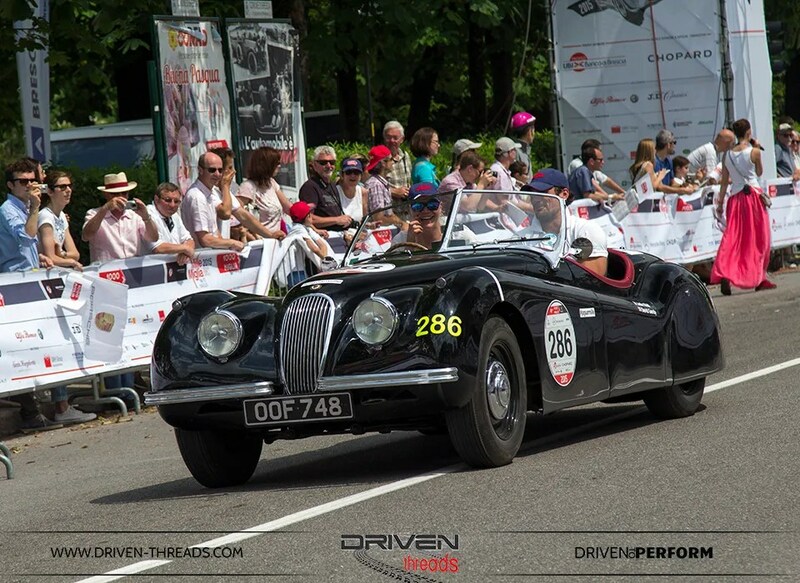 LeMans legend Derek Bell behind the wheel of a gorgeous C type Jaguar. 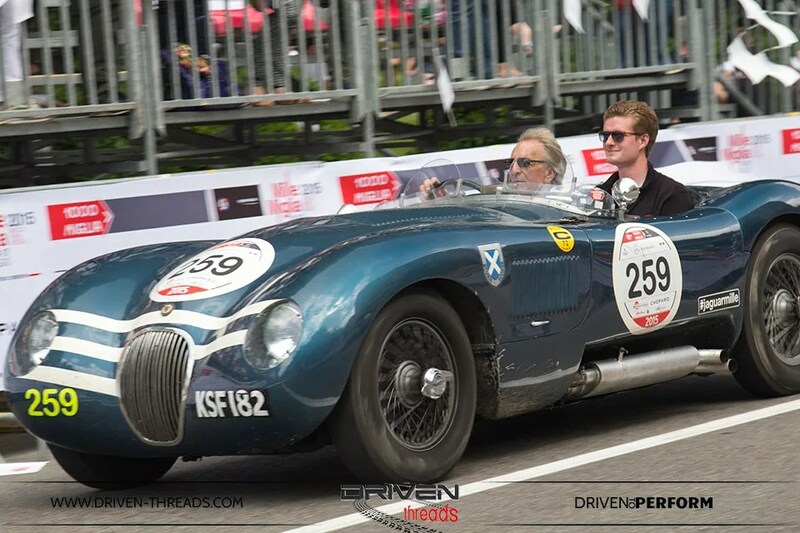 Singer Example with his Dad in this beautiful XK140. 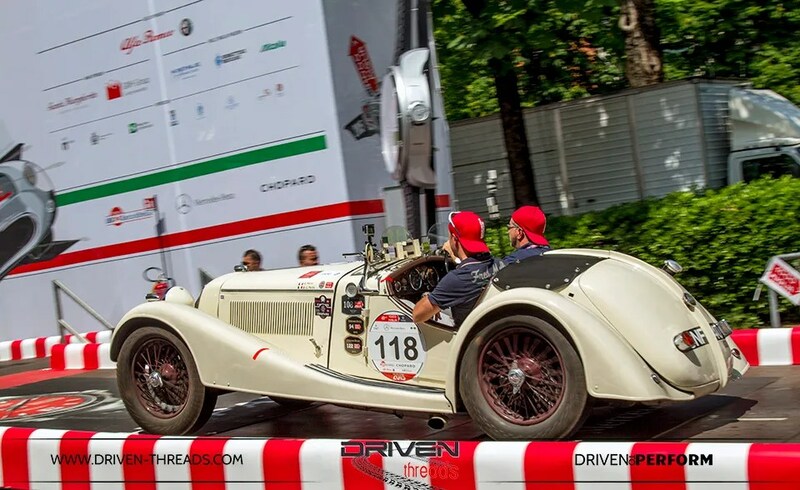 The Mille Miglia wasn’t all about motoring legends from last century. A couple of young gun groupies also stole the show at the finale. 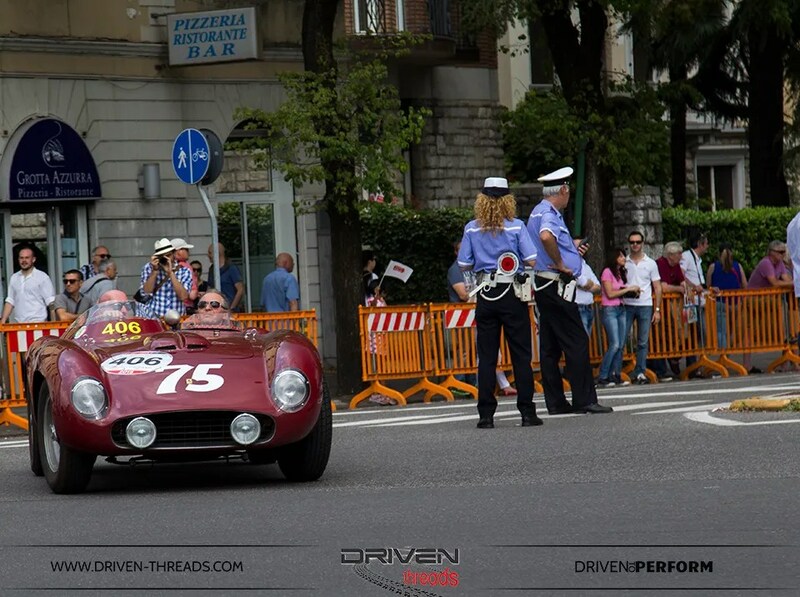 This year the Ferrari Tribute saw 130 Ferrari’s built between 1958 and today lead the competition cars. 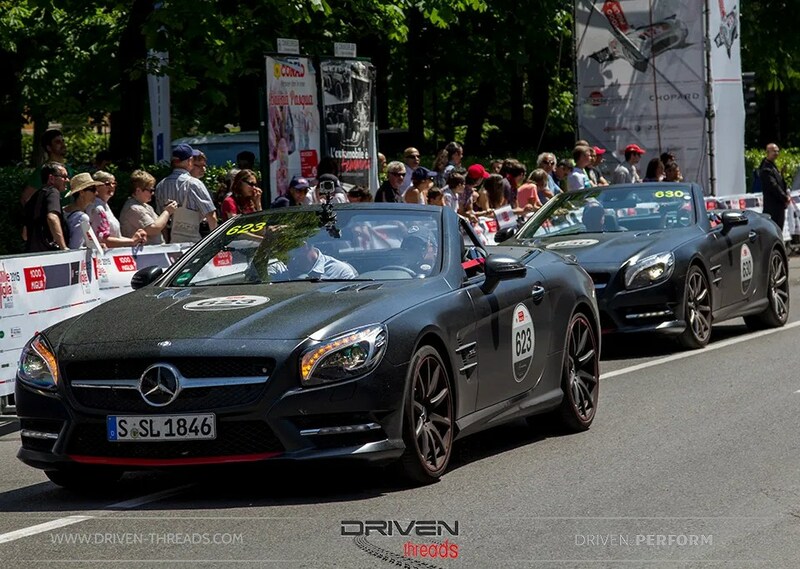 After the Ferrari onslaught, the street was filled with modern Mercedes of all descriptions. 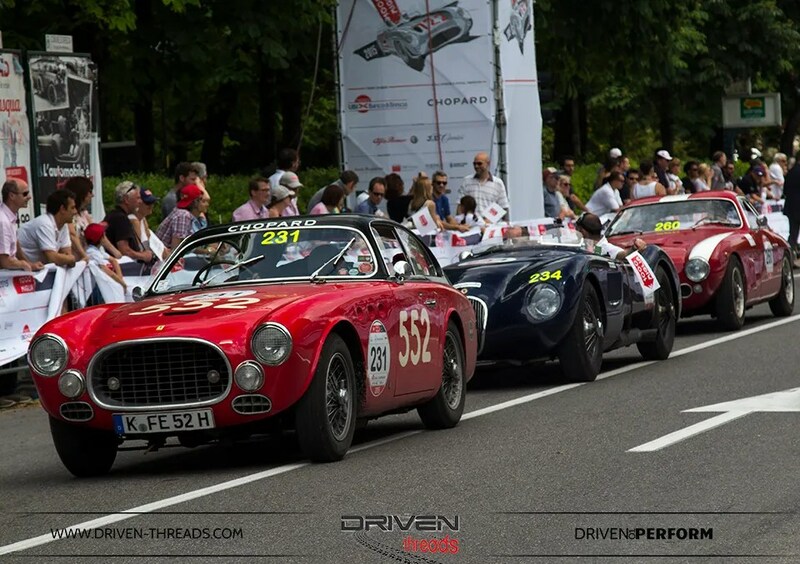 Including many of the new limited edition SL roadster to celebrate the 60th anniversary of the 300 SL victory in the production sports cars class at the 1955 Miglia. 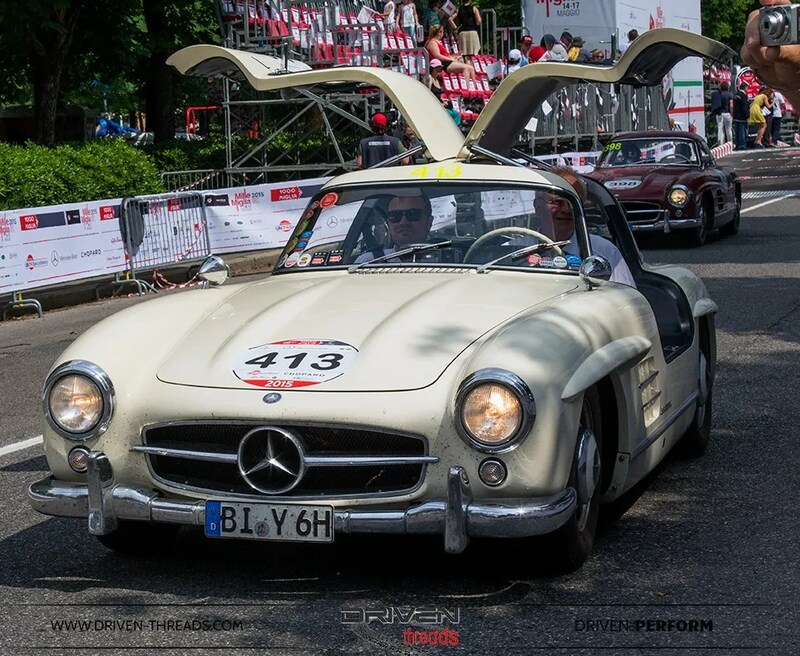 And there were plenty of 300 SL Gullwings. 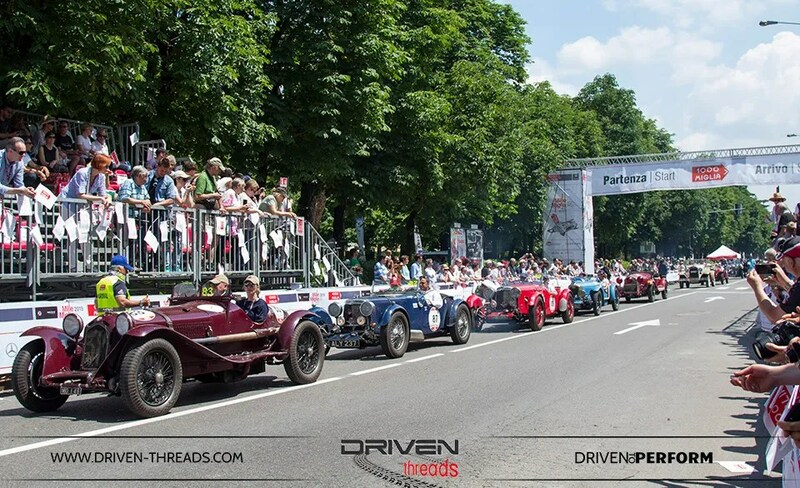 In fact we don’t think we have seen so many at a single event. 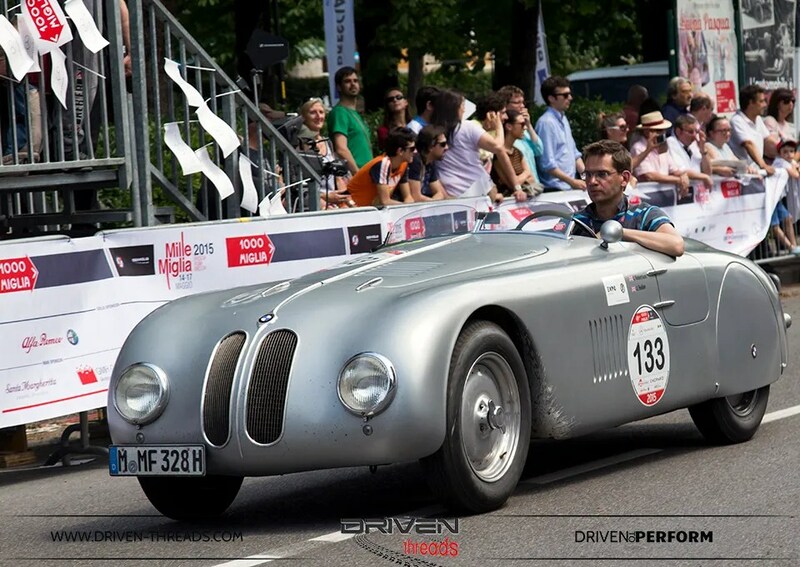 A trio of BMW 328’s approach the finish line. 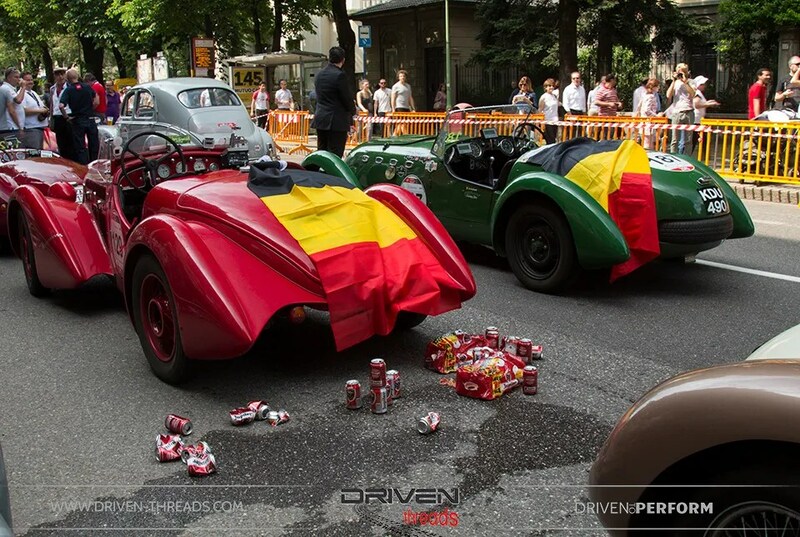 Many driver’s also got into the period spirit matching the authenticity of their cars. 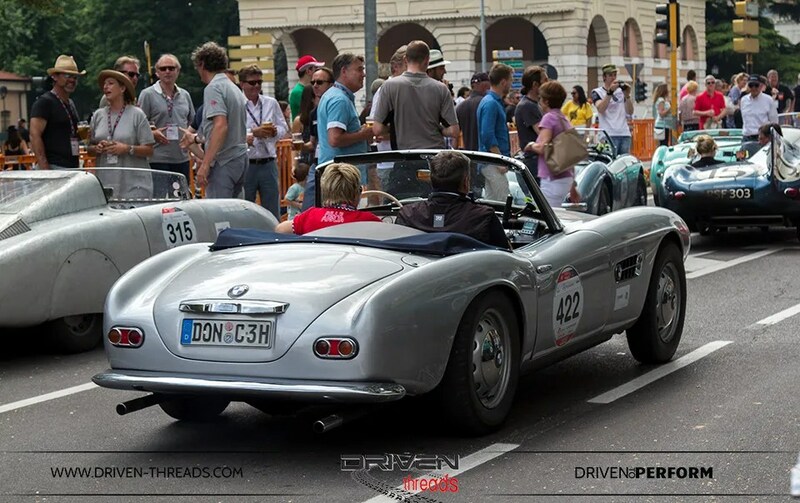 It was great to see sports cars being used as they were intended. 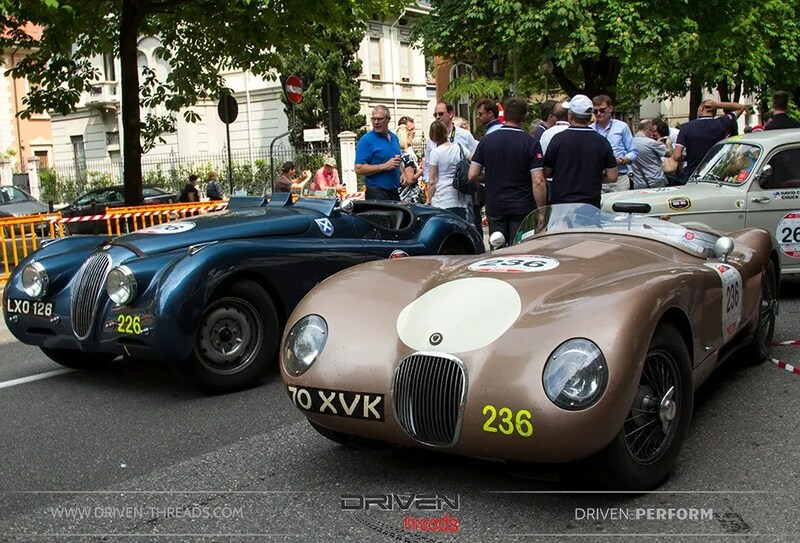 Jaguar Heritage had a strong presence, with many XK, C types and D types participating. 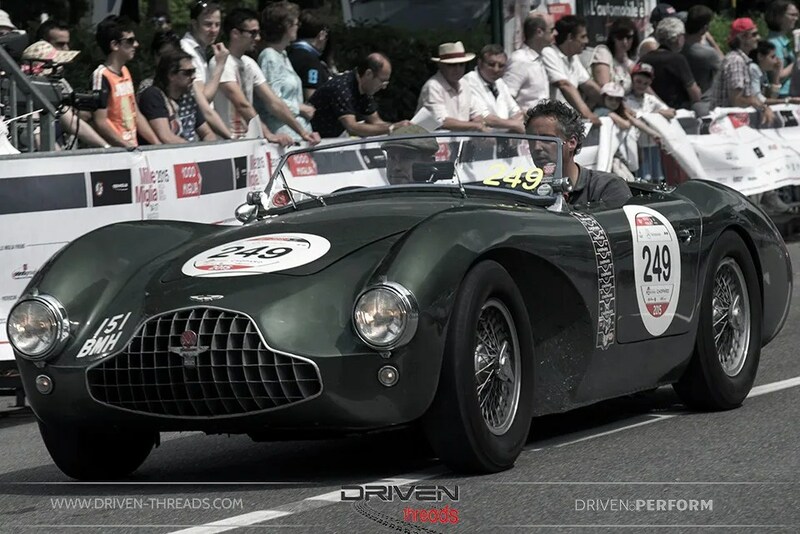 A range of classic cars produced later than 1957 were used as Support Vehicles. 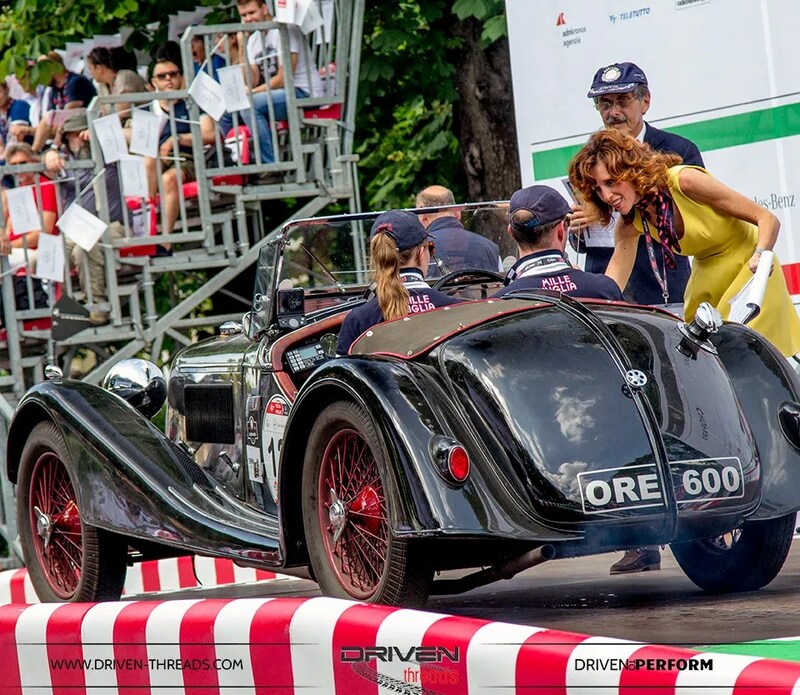 This Alfa below was actually a spectators car. 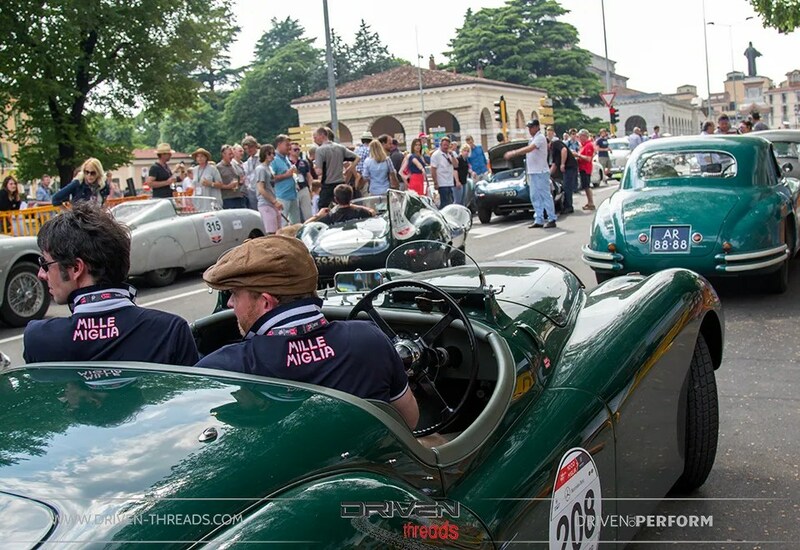 After the parade the streets of Brescia, brimmed with millions of dollars of classic car madness. People on the street. 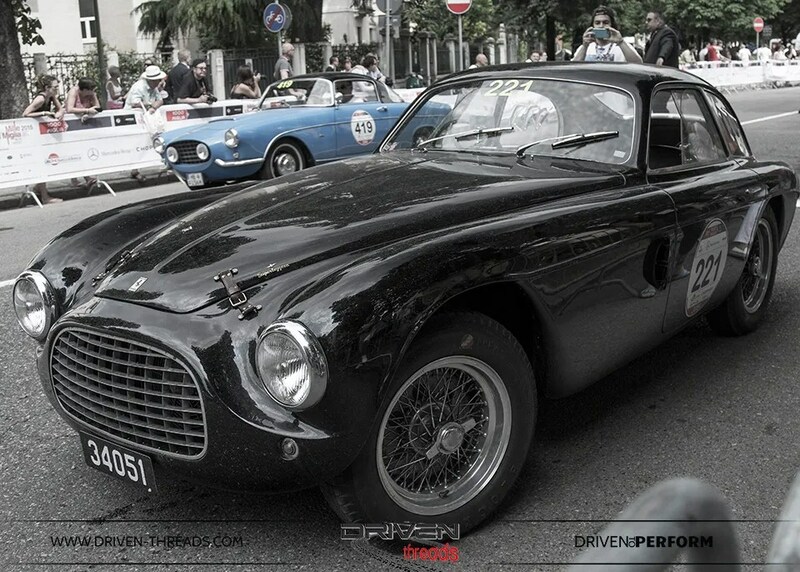 Stunning cars everywhere. 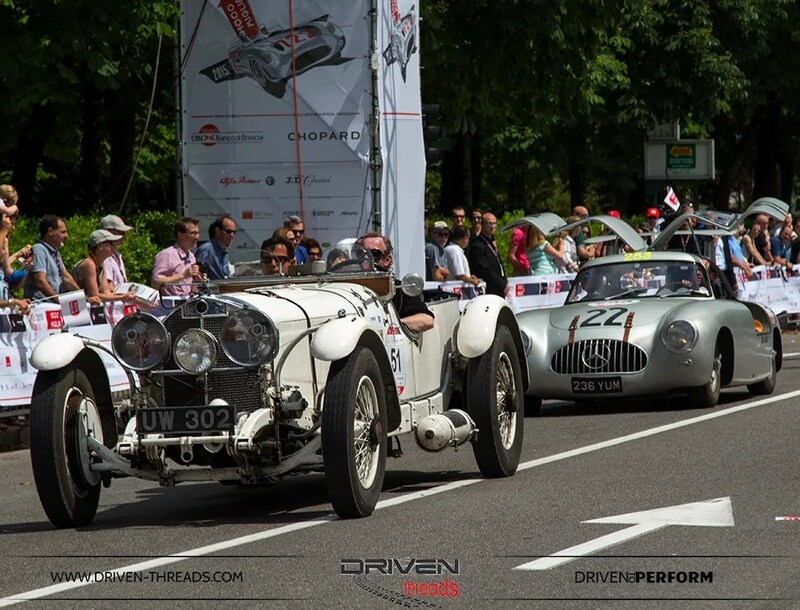 It was automotive chaos. 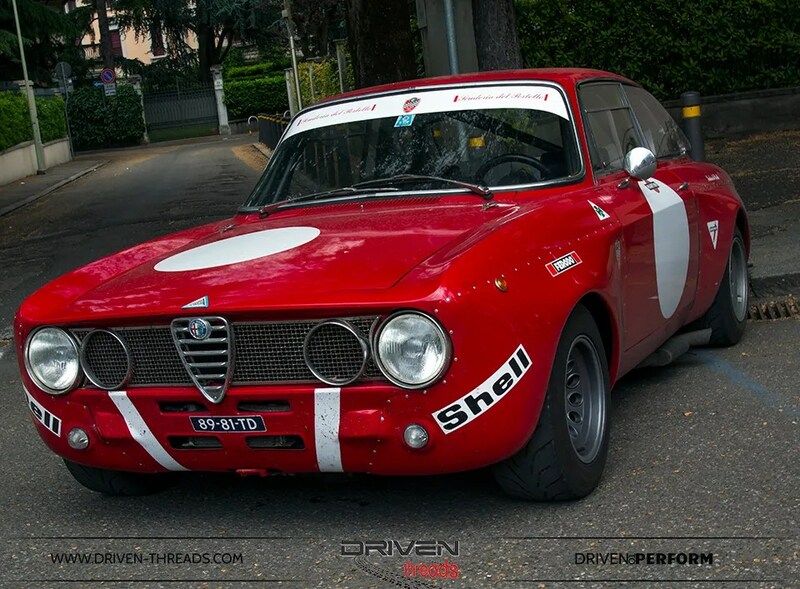 In an Italian way. 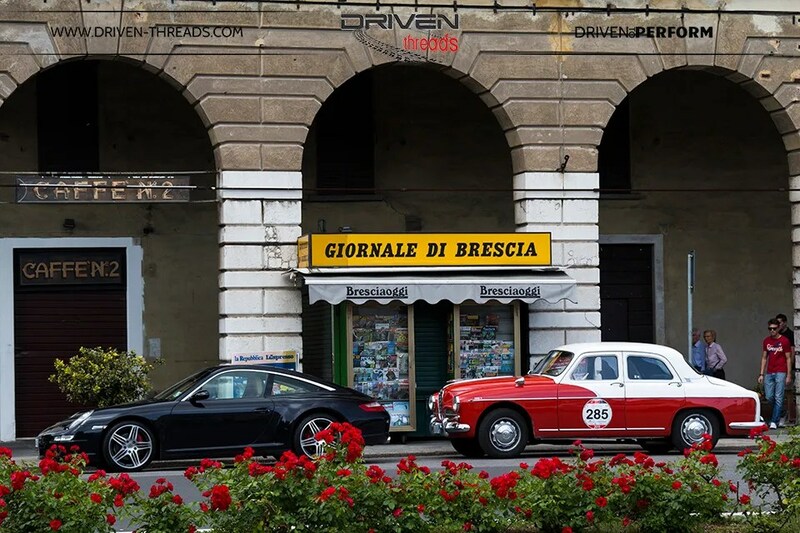 A handful of cars parked up in the main streets of Brescia, to continue in the celebrations. 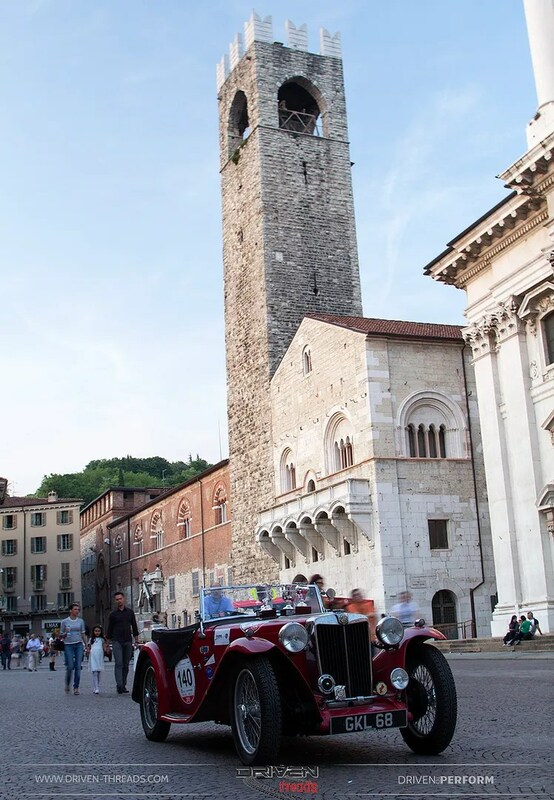 The grand old city of Brescia forming a fitting backdrop to the conclusion of the most beautiful road race in the world. 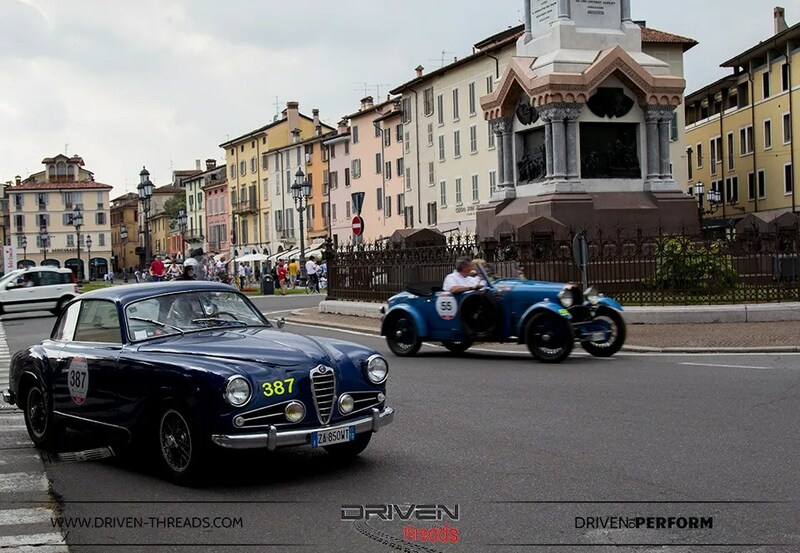 We hope you have enjoyed our coverage of the Mille Miglia. 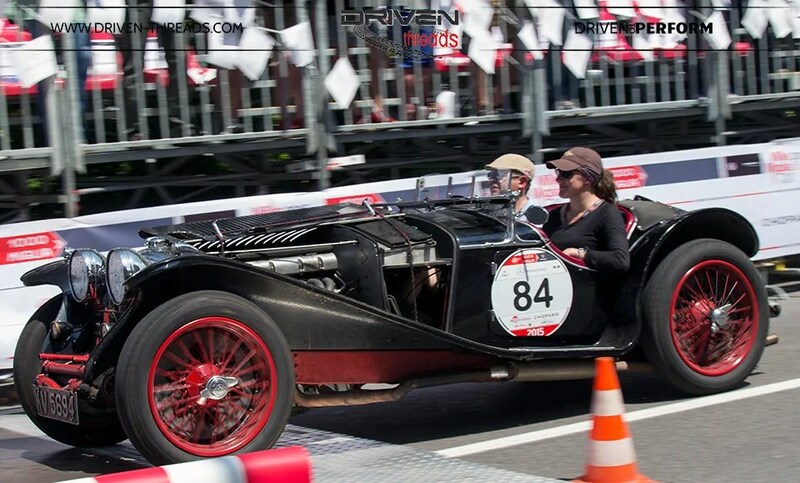 We’ve got loads more on this breath-taking event coming up. Watch this space.